A fatherhood program should never stand alone. Think about that statement for a moment. What does it mean? It means you should implement a fatherhood program within a broader array of programs and services that meet fathers’ needs beyond their role as a dad and that, at the same time, help them fulfill that role. When we train facilitators on National Fatherhood Initiative’s (NFI) programs, we emphasize that best practice. Take the InsideOut Dad® program, for example. 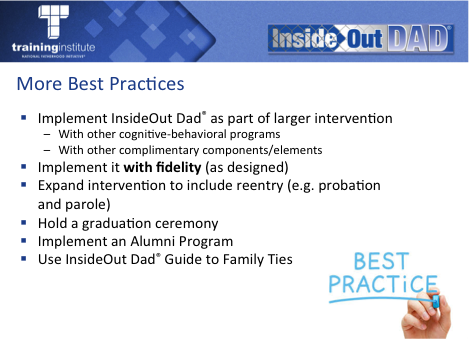 As the PowerPoint® slide below from our training on this program for incarcerated fathers indicates, we encourage facilitators to integrate the program within a larger intervention of cognitive-behavioral programs and other complimentary components. That’s because helping inmates to become better dads is only one aspect of success in reentry. Indeed, NFI produced a free downloadable guide on eight other components programs for incarcerated and formerly incarcerated fathers must address titled Engaging Fathers for Successful Reentry. The mission of Taos MEN (Men Engaged in Nonviolence, Inc.) is to inspire, train, and empower men and boys to lead lives of nonviolence. They have found that a key ingredient in working with dads in recovery is helping them practice fathering by getting involved as a mentor. Some of the best mentors are dads who have struggled or encountered roadblocks (legal or otherwise) in connecting with their children. Taos MEN encourages these dads to serve as mentors to dads with similar struggles. 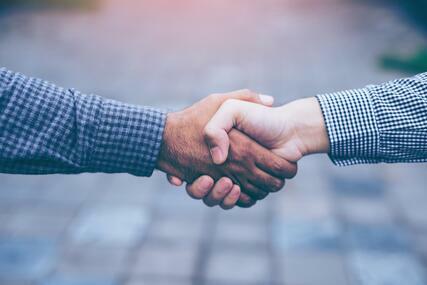 Acting as a mentor had the added benefit of helping these mentors continue to regain the confidence and relational skills they need to be there for their children. It includes examples of some fatherhood programs that have integrated mentoring into their range of reentry services. 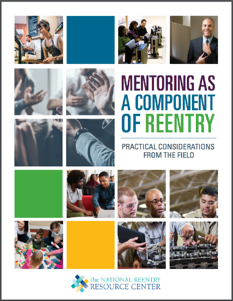 If you have a reentry effort, or plan to start one, I recommend you download this free guide to enhance that effort. Does your organization have or want to help incarcerated and formerly incarcerated dads successfully reenter the lives of their family and community? If so, have you considered implementing a mentoring component?